Kauri are among the world’s mightiest trees, growing to more than 50 metres tall, with trunk girths of up to 16 metres. They covered much of the top half of the North Island when the first people arrived around 1000 years ago. Maori used their timber for boat building, carving and housing and their gum for starting fires and chewing (after it had been soaked in water and mixed with the milk of the puha plant). The arrival of European settlers last century saw the decimation of these magnificent forests. Sailors found the trunks of young kauri were ideal for ships’ masts and spars and settlers who followed discovered the mature trees yielded sawn timber of unsurpassed quality for building. The gum, too, became essential in the manufacture of varnishes. Gum was obtained through digging, fossicking in treetops, or, more drastically, by bleeding live trees. The exploitation of forests increased with the demand for more and more cleared farmland. Kauri forests once covered 1.2 million hectares; now they have been reduced to 80,000 hectares. A lasting reminder of the once-thriving kauri industry are the kauri dams which walkers can see relics of around the Coromandel. Kauri driving dams were built by loggers to drive large quantities of kauri logs downstream from remote areas. While they played a major role in the destruction of the forest, they were also impressive. There are still stands of kauri that were left untouched by the early pioneers. Visitors can see a number of these at relatively short distances from the road. 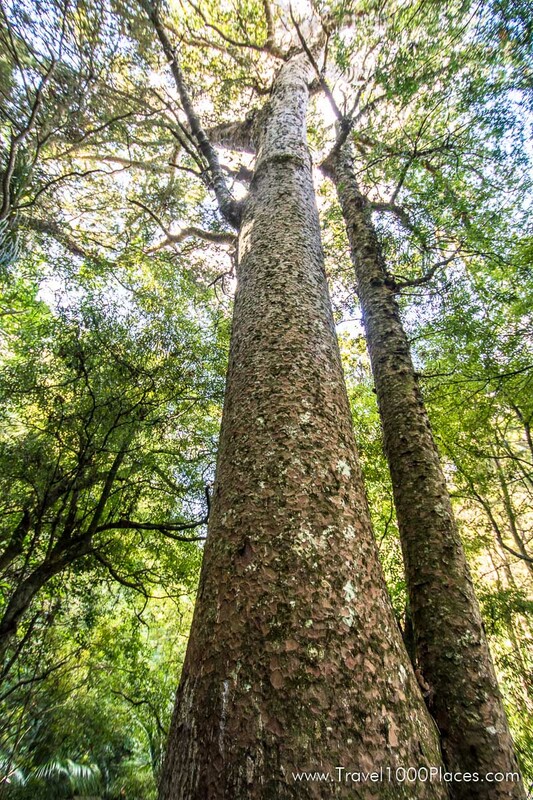 The sixth largest kauri in the country, Tanenui, is growing at Manaia on the Peninsula. One of the Peninsulas’s best remaining kauri stands. Walk access begins at the end of the sealed Waiomu Valley Road. Approximately 20 mins from Thames. The 15th largest kauri on the Peninsula is found just west of the Tapu-Coroglen road summit. Estimated to be 1200 years old, this tree has an unusual square-looking shape. The walking track to the tree is short but steep; from the viewing area visitors get good vies across to Maumaupaki (Camels Back) on the main Coromandel Range. Just north of Tairua, a walking track begins beside the twin kauri. Ten minutes into the reserve, you’ll come to groves of tree fern and kauri.